Having lived as a student of foreign languages in Milan and, later, having worked as a teacher and translator in Cologne, the bicycle became my primary means of transportation. When I moved to Crete, my interest toward it did not fade and I still continue to use it to this day. 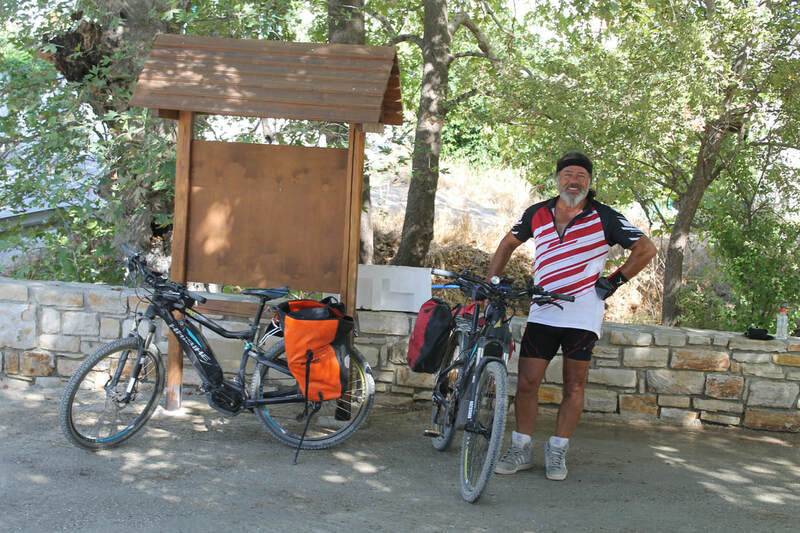 I live with my German-Greek family between the villages of Dafnes and Siva, right in the middle of one of the most famous wine-producing regions of Crete, and I regularly cycle to my workplace in Heraklion covering a distance of 21 km. Moreover, only 50 km away from my house lay the stunning beaches of the southern coast of Crete. 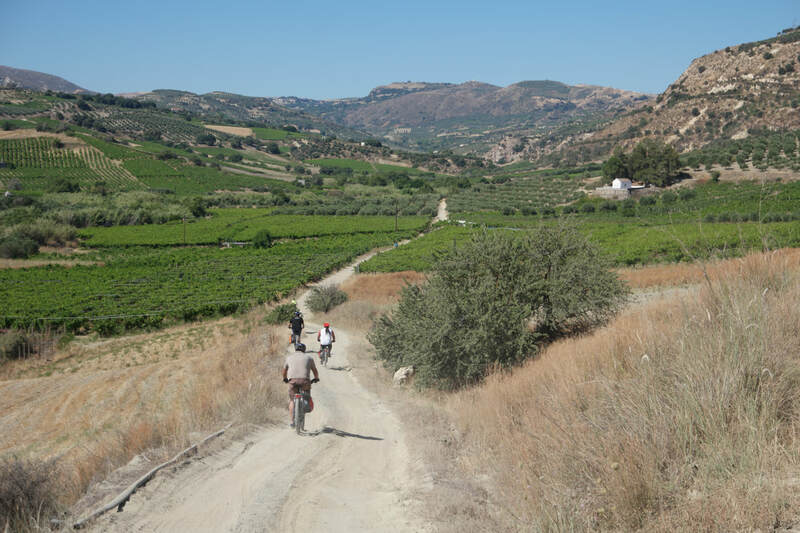 Cycling is one of my favorite pastimes and through it, I have discovered the most beautiful locations and landscapes this region has to offer, which can easily stand their ground even when compared to the beauty of Tuscany. Since 2011, I have converted to mostly using a Pedelec. Crete is extremely mountainous and, during the months of July and August, the temperatures can rise to 30oC. Therefore, the E-Bike is an ideal means of transport, since it is fast and not as sweat-inducing, even in the heat of the summer. Individual tours: My goal is to introduce my guests to the island of Crete from a completely different perspective. 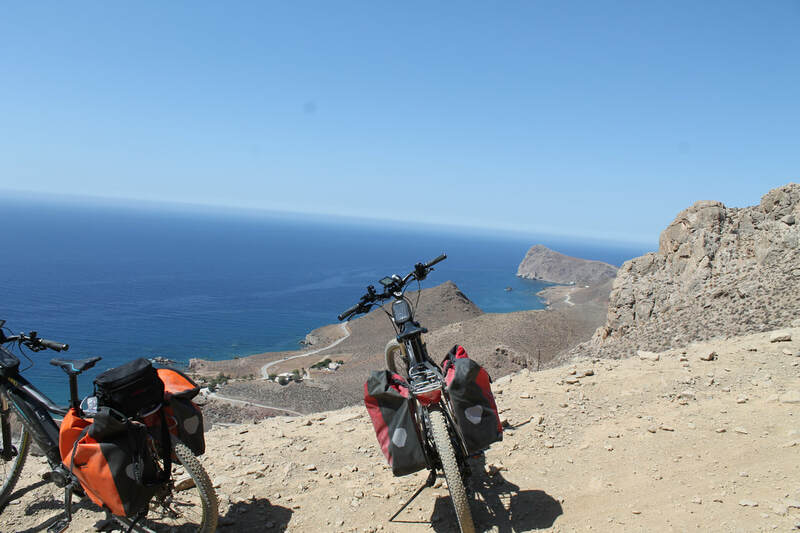 Thanks to the convenience and speed of the Pedelecs, one can easily combine and enjoy the beauty of both the mountains and the sea. 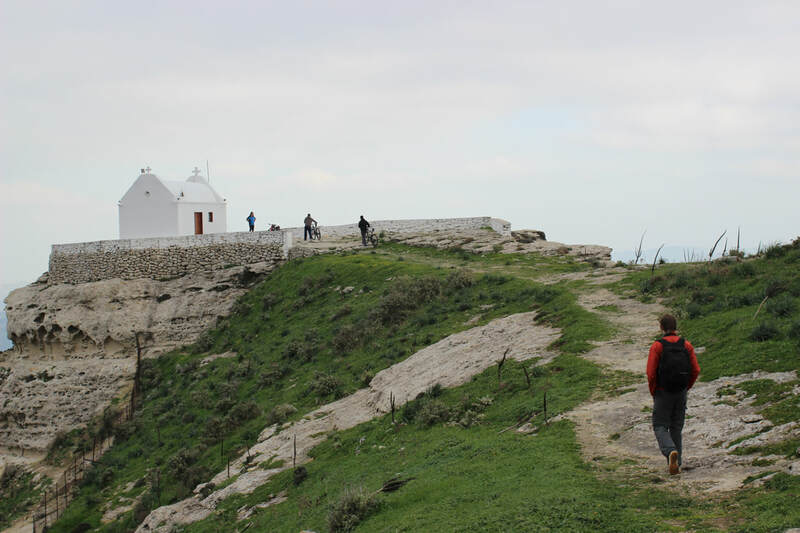 In addition, the experience and knowledge of the tour guide will form the bridge between the participants and the nature and people of Crete. However, in order to maintain the personal and more intimate character of the tours, no more than 4 people should be allowed to participate. Environment: Ecology constitutes an important concern for us. Consequently, not only is the E-Bike itself eco-friendly, but also all batteries are charged using solar power. At this point it should be noted that, early in the season, we regularly visit and monitor the paths. Self-sufficiency: Our personal energy requirements are completely covered by a photovoltaic system and we are therefore 100% self-sufficient. Moreover, we collect rainwater in a 30m3 cistern, which provides us with fresh water for over half a year. We also keep the following livestock: goats, sheep, turkeys, chickens and rabbits, and are thus able to produce our own meat, eggs and dairy. We cultivate our own vegetables, while various different fruit trees and plants adorn our yard and garden. What we do not produce ourselves, we purchase from the surrounding villages, maintaining regular contact with the local farmers, shepherds and beekeepers. ​An E-Bike, or electric bicycle, operates using the power produced by its rider and an electric drive system. The Pedelec (Pedal Electric Cycle) is a special type of E-Bike whose movement power is generated by a built-in electric motor linked to the rider’s pedaling contribution. What this effectively means is that if the rider does not use the pedals, the engine of the Pedelec will not be able to function. 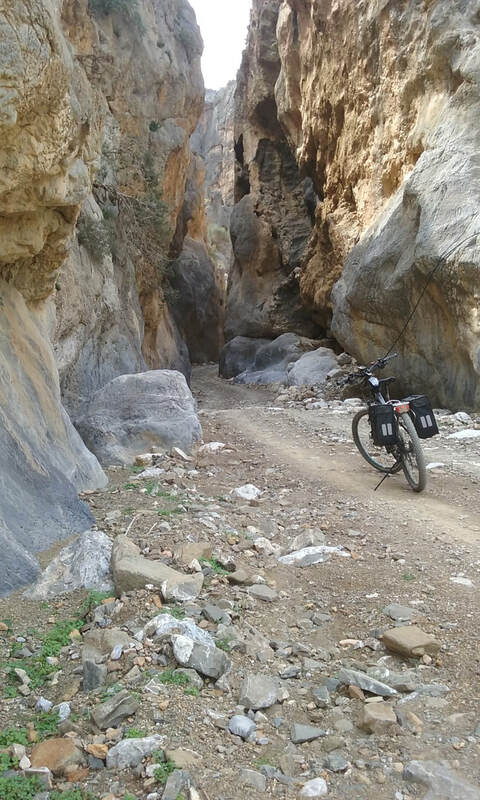 Through my personal experience I have learned that, on a mountainous route, one can reach a maximum speed of approximately 6 to 7 km / h with an ordinary bike. However, depending on the support provided by the motor, an E-Bike can reach up to 10 to 18 km / h with significantly less pedaling effort. Consequently, travelling can become easier without feeling as tired or sweaty. The durability of the battery depends on the riding style, the weight of the rider, the wind and, of course, the morphology of the ground. On average, it can support the bike for approximately 70 km. Our electric bikes are equipped with 400 Wh batteries, which can cover very long distances in one day. If more power is needed, the batteries can be charged during the breaks, achieving an extended cycling period. 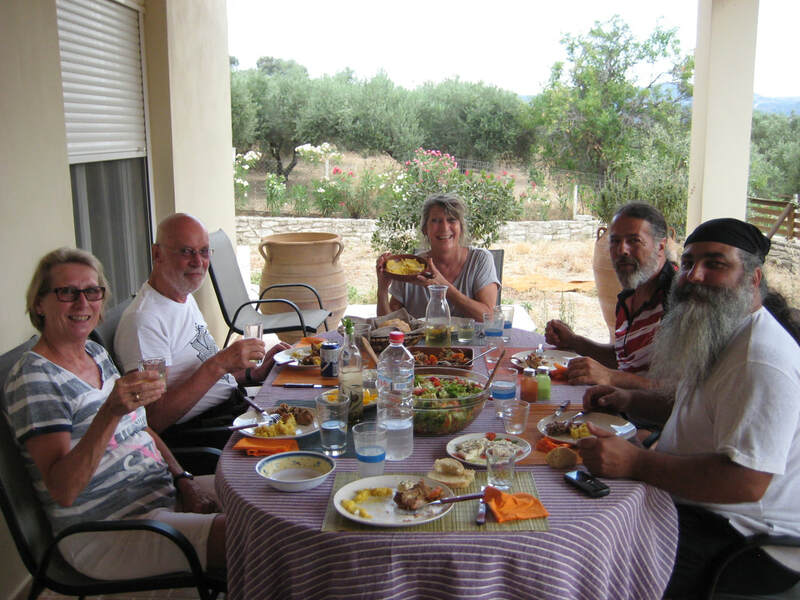 The tour will start at 8:30 am after enjoying a Cretan breakfast in the village of Siva. We will have returned by approximately 14:00 pm. On this tour you will be provided with the opportunity to visit the villages of the area, hidden amidst the vineyards, and enjoy their beauty and attractions. Naturally, wine and Raki tasting is also possible. We will leave at 8:30 am after enjoying a Cretan breakfast in the village of Siva, and then return at approximately 20:30 pm. We will need about 3.5 hours to cover the 47 km distance to the "Tripiti" beach which is near Lentas. After we arrive at 12:00 am, we will take a dive in the Libyan Sea and bask in the sun on the beautiful sandy beach. We can also have a light lunch at the small tavern that is situated directly above the beach. If we wish to be back to our starting point by 20:30 pm, we will have to leave at around 17:00 pm. Naturally, it is strongly recommended to apply sunscreen and wear a hat. 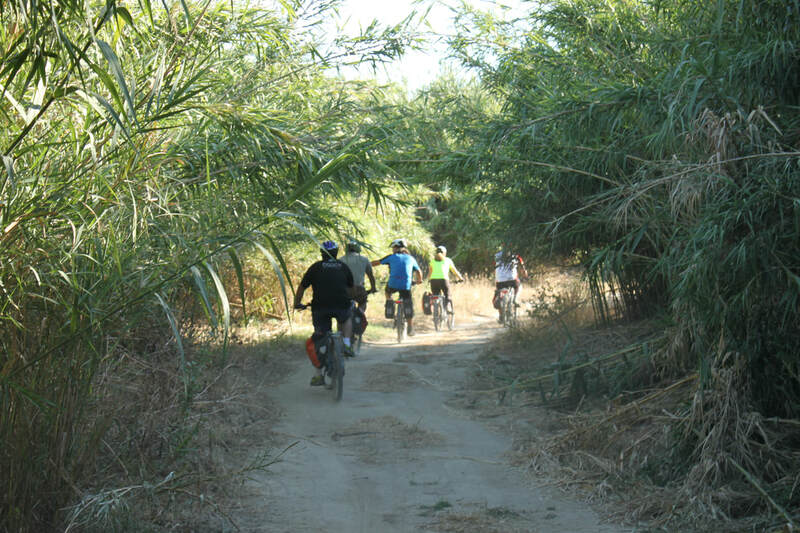 We will leave at 8:30 am after enjoying a Cretan breakfast in the village of Siva, and then return at around 16:00 pm. 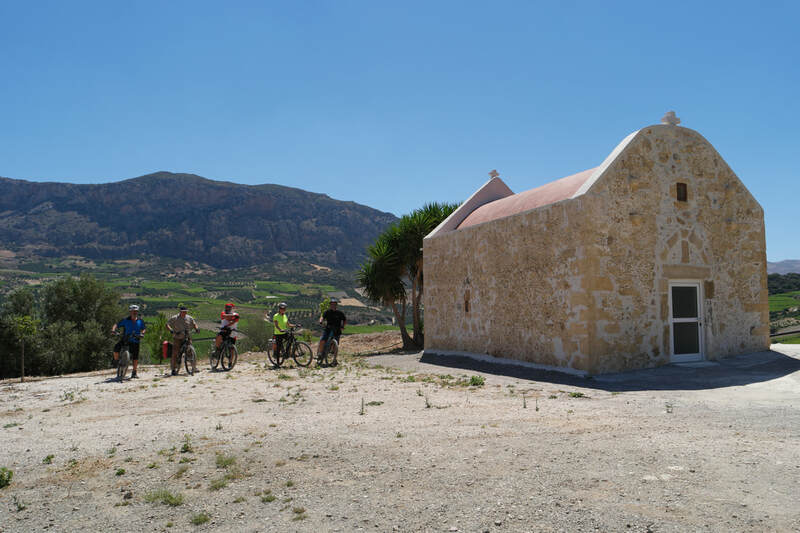 Our goal will be to explore the inland of the Region of Heraklion, visit the most important vineyards of the area and taste the wine and the raki (Cretan grape brandy) produced by some local winemakers. On this tour, we will often meet and interact with the locals, taste their products, or even purchase some of them on the spot. Any purchases will be delivered to the hotel on the next day. Our last stop will be Rita’s winery in Siva where we will conclude our wine tasting adventure. The tours described above are examples. Individual tours can be arranged if desired. Guests will be picked up from their hotel in the Heraklion area at the arranged time. No later than 7:30 am, the group will arrive at my house, which is located between the villages of Dafnes and Siva, 15 km from the city of Heraklion. We will have our breakfast at around 8:00 am. The traditional Cretan breakfast we offer typically consists of homemade bread, our own eggs and goat milk, homemade cheese and Cretan thyme honey purchased from a local beekeeper. All participants are required to wear a helmet during the tour. Moreover, it is the personal responsibility of each individual to make sure they are following the traffic regulations. In case there is someone who cannot continue with the tour, they can always be picked up and transported by car. Every participant should have medical insurance. In case of injury, we will provide transportation to the nearest doctor, but we will not be responsible for covering any medical expenses. Since our tours are personal, you can modify and personalize them as desired, after consulting with all 4 participants. 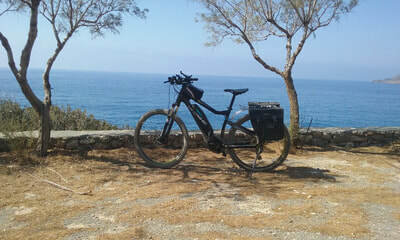 Our E-Bikes are purchased from the company Haibike. 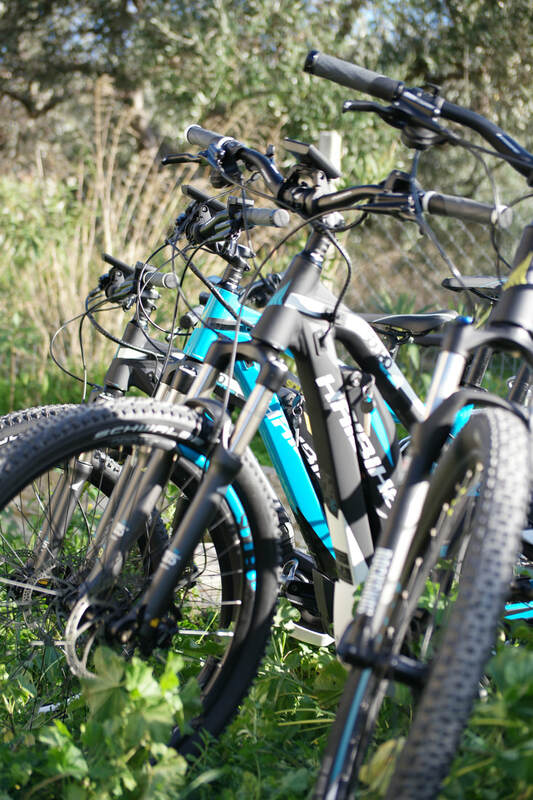 They are all E-mountain bikes with thicker 27.5" tires, equipped with a 10 & 20-gear derailleur system, in order to facilitate access to the steepest of slopes. 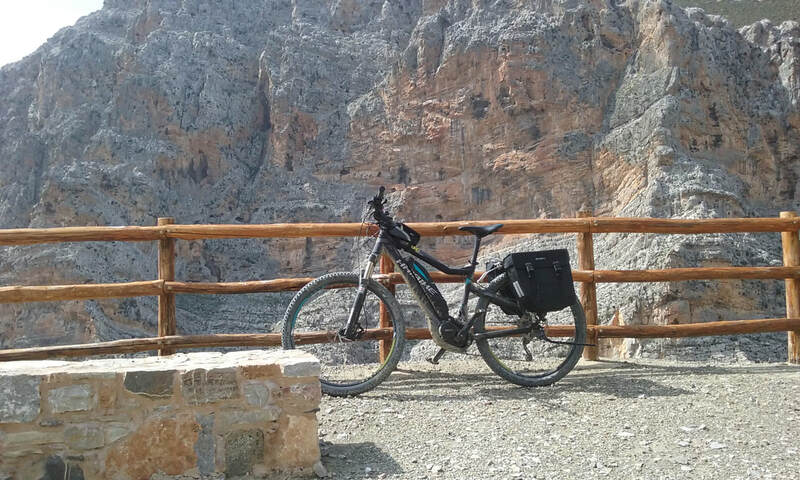 These E-Bikes were selected for the following reasons: they are very high quality, easy and comfortable to ride and their circuit function is excellent. Moreover, their thick tires designed for mountain cycling are ideal for both the bumpy Cretan dirt roads and the asphalt. We have equipped our bikes with bike porters and, if necessary, we can also provide lighting systems. The most important feature of this E-Bike however, is its 400 Wh battery and powerful 250 Watt Yamaha motor, which can allow for speeds of 25 km/h. We can thus ensure the best possible conditions for covering long distances. All our bikes have liability insurance. The starting point of our tours is the area where I live with my family; it was formerly known as Tetrachori (meaning four-village region), since it consists of four nearby villages: Dafnes, Siva, Venerato and Avgeniki. These villages are within a radius of 3 km from one another and at an altitude of 280-350 meters above sea level. The area is dotted with hills as it is located near Mount Psiloritis. The sea is also at a close distance: the Sea of Crete (north coast) is only 18 km away while the Libyan Sea (south coast) is at a distance of 50 km. The main occupation of the inhabitants is agriculture and sometimes livestock. They primarily produce wine and olive oil, which also constitute their main source of income. Tourism is almost inexistent in this area with only very few houses available for tourists to rent. Most visitors simply traverse the region in order to reach their preferred coasts. Consequently, the locals have never been subjected to mass tourism, even though they live close to both the sea and the city. 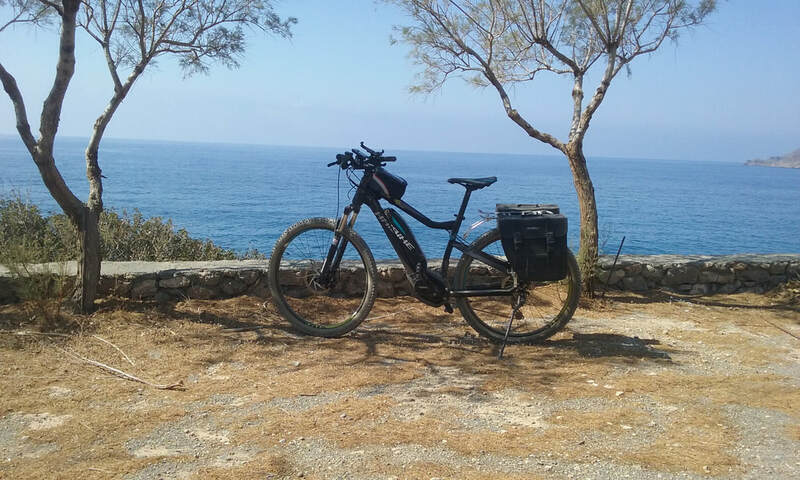 Using this area as a starting point will allow visitors to either walk or cycle and, preferably riding an E-Bike, enjoy the sights that most tourists in Crete never get the chance to see.